How do energy ratings work? We’ve all heard something vague about how buying the most energy efficient appliances will help to protect the environment and our back pockets. But what do energy ratings mean? And is an appliance with a higher energy rating really going to save you money in the long-run? As the cost of electricity rises higher and higher, the energy efficiency of your appliances remains one of the biggest factors in determining the size of your monthly bill. Having one inefficient appliance may seem like a small deal, but when you’ve got a household full of them you’ll definitely be in for some financial pain. Appliance energy ratings exist to help you choose the most efficient products on the market, and we have put together a guide to energy ratings in order to help you make more informed choices about the appliances you buy. What are energy rating stickers? Energy rating labels are a Federal Government initiative designed to help consumers by displaying an energy rating for appliances on a 6 star scale. Star ratings can come in whole or half star increments, with their energy efficiency determined by the energy service per unit of energy consumption – the lower the energy consumption per unit of energy service the higher the star rating. Energy efficiency labels display two things: a star rating and an estimate of the appliance’s annual energy consumption in KWh/year. It’s worth noting that certain appliances such as three-phase air conditioners and pool pumps can carry efficiency rating labels, but they aren’t required to. The full list of products which are required by law to be registered for energy labeling or for Minimum Energy Performance Standards (MEPS) in Australia and New Zealand can be viewed here. The minimum standards which appliances must meet, as well as the way their energy consumption is tested, are regulated by the Australian Greenhouse and Energy Minimum Standards (GEMS) Regulator. The Regulator was established in 2012 through federal legislation of the same name, and simplified the system by creating nationwide standards and replacing all the state regulators. The legislation is outlined here. Will you save money by buying an appliance with a high star rating? We can confidently tell you that yes, you will spend less money in electricity if you use a more energy efficient appliance. However, it’s important to note that this represents a long-term saving which you may not notice on a day-to-day basis. What you probably will notice however, is the extra money you’ll generally need to fork out upfront for a more efficient appliance. Can your current budget accommodate the cost of a more expensive appliance? Energy efficiency is nice, but don’t ruin your finances in order to achieve it. How do the long term savings on running costs compare to short term savings on the purchase price? No one will blame you for deciding that you’d rather have $300 spare right now, rather than save that same $300 over the course of a decade or so. What are the actual savings you can make on your electricity bill by purchasing a more energy efficient appliance? You may not even stand to save $300, so it’s important to know how much you’ll actually avoid paying. You can use the comparison tool on the government’s energy rating website to figure out how much you stand to save. Model 1: Has a 2.5 star energy rating, costs $1,299, uses 468kWh of energy per annum, and therefore has an approximate running cost of $117 per year. Model 2: Has a 4 star energy rating, costs $1,377, uses 318kWh of energy per annum, and therefore has an approximate running cost of $79.50 per year. So although Model 1 may save you $78 in terms of initial purchase cost, over a year it will cost you around $37.50 more in running costs. So if you go with Model 2, you will have made your money back after three years, and assuming that your fridge lasts for the average lifespan of 14 years, you stand to save over $400 in terms of running costs and electricity bills over that period. Keep in mind this is a rough estimate, and the efficiency of every appliance will vary, as will the price each individual pays for power. However, it does demonstrate that there are savings to be had by purchasing more energy efficient appliances. Is the Energy Ratings program effective? 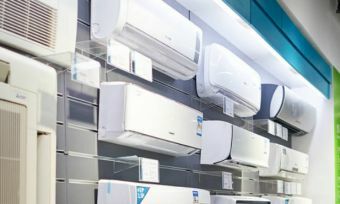 It would appear that yes, the energy star rating system helps to both influence consumer purchasing decisions and encourage manufacturers to improve the energy efficiency of products on offer. The government’s E3 Impact Projections Report estimates that for every $1 of expenditure on the program (including costs to consumers), $4.60 worth of savings is achieved. Additionally, the E3 program is expected to save 129 million tonnes of CO2-equivalent emissions between 2014 and 2020, and 433 million tonnes between 2014 and 2030. That has to be good for both consumers and the environment!